Treatment of an acoustic room and studios will often require sound diffusers. Sound diffusers are used to distribute and scatter sound waves which contribute to reducing static sound waves and reverberation. Sound or acoustic diffusers are used to help provide greater sound coverage for speech and music and contribute to improving speech intelligibility and music clarity, particularly in large rooms and halls such as, lecture theatres and conference rooms. If just sound absorption is used in a room reverberation of noise may be eliminated but it still may be impossible to hear speech clearly which is why it is important to include sound diffusers to help spread the sound more evenly over the entire room. There are two types of sound reflectors that give the best performance, the Pyramid diffuser as shown above and the Barrel diffuser. The two designs can be used to create different wall and ceiling patterns and when used along with our sound absorbing products optical performance can be obtained. Pyramid sound diffusers have an offset pyramid design and are ideal for wall or ceiling applications in rooms used for all music and choral activities requiring optimum acoustical performance. 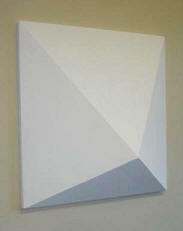 The pyramid sound diffuser can be installed randomly to create interesting patterns and designs. Barrel sound diffusers are specifically engineered to redistribute sound more evenly to areas requiring a higher degree of sound diffusion such as in concert halls and recording studios. FINISHES - Our Sound Diffusers come in a standard white primer coat and can be painted to any other colour using a water based emulsion paint. 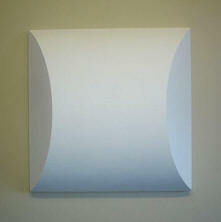 The efficiency of our sound diffusers is enhanced the more times they are painted. Our Sound Diffusers are very easy to handle due to their lightweight construction which makes them exceptionally easy to install. To avoid accidental damage to the panels we recommend they should be fixed to high ceilings and walls. They can be fixed with our special mastic/adhesive. Please look at the installation guide for full installation instructions.